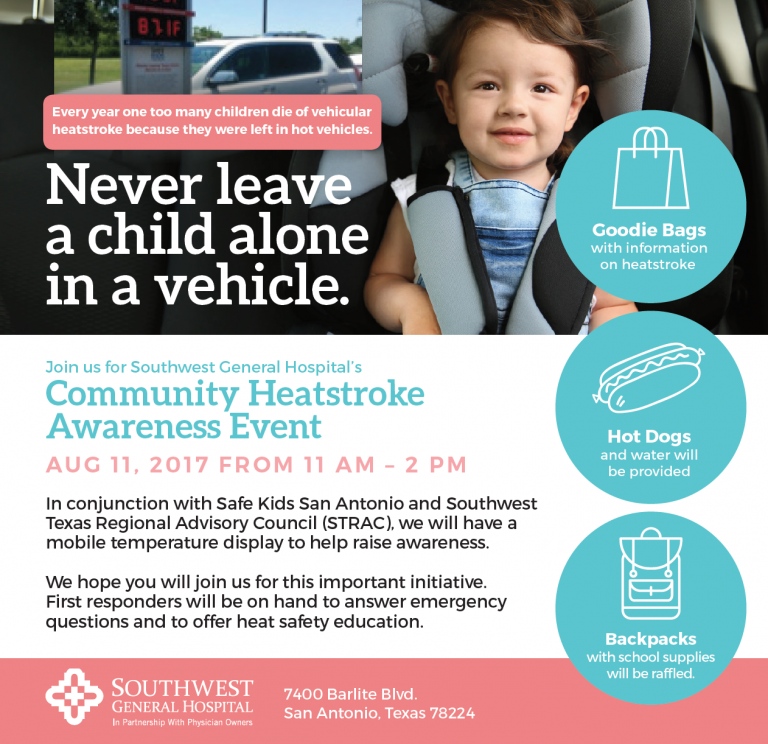 In conjunction with Safe Kids San Antonio and Southwest Texas Regional Advisory Council (STRAC), Southwest General Hospital will have a mobile temperature display to help raise awareness. First responders will be on hand to answer questions from the San Antonio community and to offer important heat safety education. Starting at 11:00am at Southwest General Hospital (7400 Barlite Blvd. ), this family-friendly event offers free food and giveaways plus a school supplies raffle. Heatstroke is an extreme medical emergency. Call 911 right away. Until help arrives, move the affected person into the shade or at least away from the heat source. Remove the person’s clothing, fan the person, and apply cool water or wet towels or sheets. If available, apply covered ice to armpits and groin. Change the towels and sheets when they are no longer cool. Continue these activities until help arrives.